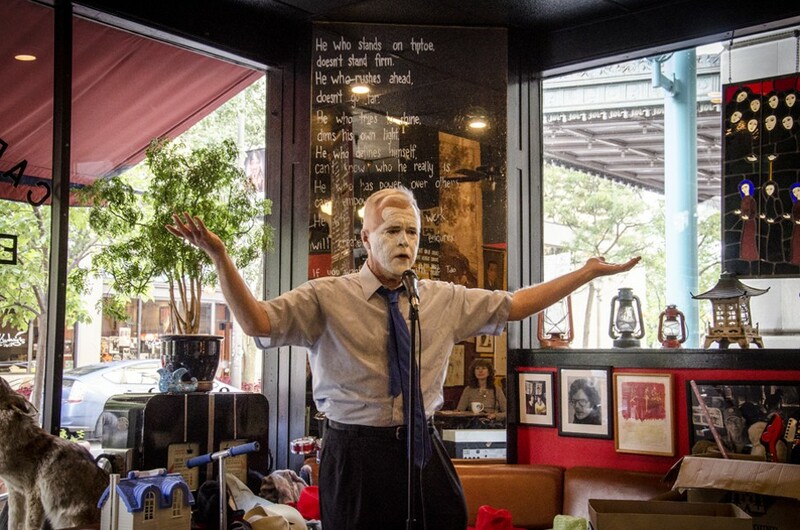 PHOTO BY MARK CHAMBERLIN Jimyn the Singing Mime performed his one-man show "Cinderella -- Just What I Needed" at Java's Cafe on Thursday. "This show is artistic, not necessarily 100 percent scientifically accurate," Stuart Wilson cautioned the audience at a certain point during his one-man production, "It's a Spaceship Now." And yes, the science involved may be dubious, but the entertainment value was never in question over the course of this 60-minute, interactive ode to DIY rocket science and 80's power ballads. Wilson plays a vaguely fictionalized version of himself, named Stu. At the start of the show, Stu is an aimless artist in need of some direction in his life, but he's spurred into action when he comes into possession of a Soviet nuclear missile (an SS-18 Satan, to be precise). How he came to possess such an item isn't important, but what he plans to do with it is: Vowing to follow in the footsteps of his engineer father -- the man from whom he inherited a love of dumpster-diving for scrap materials -- Stu plans to transform his weapon of mass destruction into a honest-to-God spaceship. Dubbing the vessel "Electric Stu," the artist hopes to use the rocket to launch himself into space. "Why?" you ask. Well, basically just for the hell of it. "How?" you may also ask, but that answer's a bit more complicated, involving igniting laserdiscs as a fuel source (it's a complicated science, and I just don't have the space to properly explain it here). The show details Stu's scientifically creative process, with periodic video interruptions from a broadcast called "Stu's News Live," in which a condescending newscaster (also played by Wilson) calls into question every decision Stu is making in his life. Wilson has such a charismatic stage presence, the audience is willing to go wherever he takes us, and that includes a hip-hop number, a sing-along about khakis (with ukulele accompaniment), and an epic dance routine about making breakfast. There may not be any deep underlying meaning motivating the plot of "It's a Spaceship Now," but Wilson is clearly having a great time up on stage, and man, his enthusiasm is infectious. There's more wit and imagination crammed into "Spaceship" than a lot of productions I've seen that are twice as long and with 20 times the budget. My viewing companion described the show as residing squarely in the center of the Venn diagram between "quirky" and "charming." See it, and I promise you'll have a blast. "It's a Spaceship Now" has two more performances: Friday, September 25, at 9 p.m., and again on Saturday, September 26, at 4:30 p.m. TheatreROCS Stage. $10. Appropriate for ages 13 and older. Earlier in the evening, I caught Jimyn the Singing Mime and his first performance of "Cinderella -- Just What I Needed." A retelling of the Cinderella fairy tale recounted through pantomime and musical numbers, the show employed remarkably similar building blocks as "It's a Spaceship Now," -- a solo show, charmingly ramshackle production values, and a catalog of 80's pop hits -- though this was unfortunately employed to somewhat less success. "Cinderella -- Just What I Needed" has one more performance on Friday, September 25, at 5 p.m. Java's Cafe. Free. Appropriate for all ages.